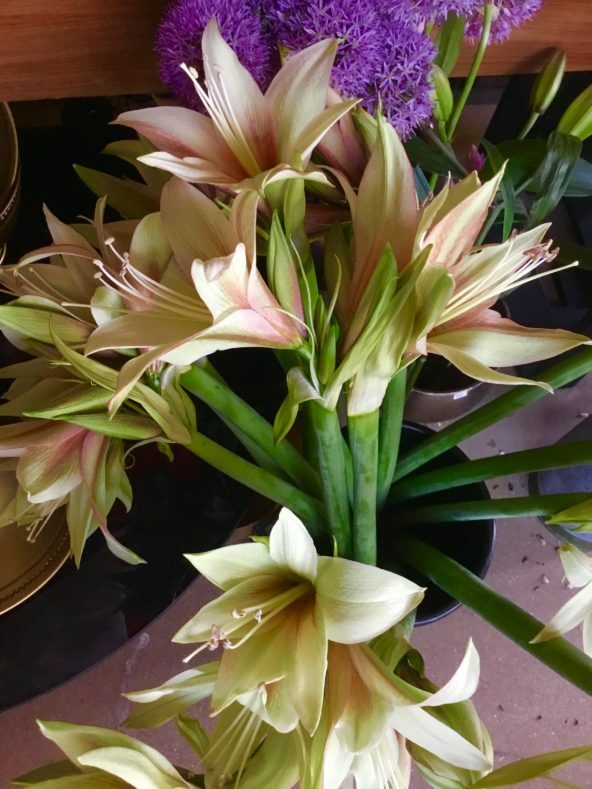 Amaryllis ‘Fledermaus’ is this beautiful watercolor-esque blend of cream, green and coral color. I enjoy the way the deeper tones in the throat of the flower lure you in. Amaryllis such as this come direct from the Holland growers. They have a tall thick but hollow stem, so we insert a thin branch up inside the bottom of the stem so that as the large flowers develops they don’t cause the stem to collapse over and break. Also because they have a hollow stem and appreciate having water up high inside, we use a small toothpick tip to pierce into the center of the stem approximately 1″ below the blooms. This allows all of the trapped air to escape and the water level to rise within the stem. You can easily hear the air and feel it on your hand when you pull the toothpick out. Amaryllis unlike lilies, don’t have a fragrance but still offer the impact of a lily with a velvety petal surface. Their peak time is from mid-December until early May. Some stems with have as many as 4-5 blooms open at a time. Follow us on Facebook at Twisted Stem Floral and twisted Stem Weddings or on Instagram @twistedstem to see how we use amaryllis is our designs.